Since last Friday, we've measured 0.85 inches of rain at our home place near Auburn. This moisture has arrived during relatively brief thunderstorms - and like many late spring rains, it's been spotty. A friend who ranches less than three miles from us measured more than an inch of rain last night! For most farmers and ranchers, the timing of the rain is as important as the total amount - and these late spring rains have been a mixed blessing for our operation. On the positive side, rain at this time of year can help our irrigated pastures. 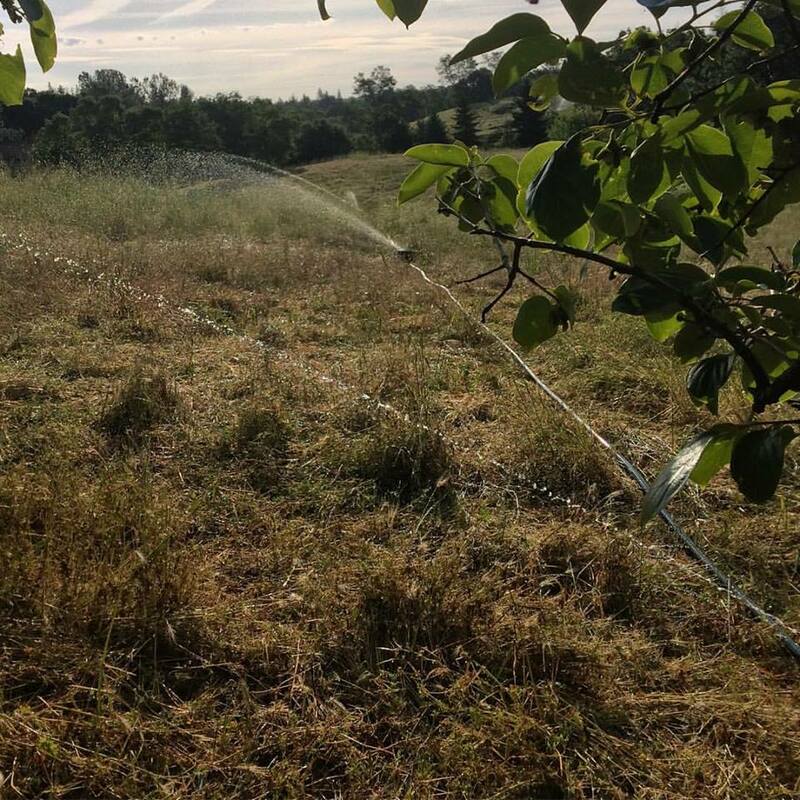 The point of efficient irrigation is to match the water applied to our pastures with the water needs of our soils and plants. I monitor this both directly and indirectly. Directly, I check the amount of moisture in our soils on a regular basis by digging into the root zone and evaluating the amount of water by the look and feel of our soil. We don't want our soils to totally dry out during irrigation, nor do we want them to remain saturated at all times. Indirectly, I monitor the evapo-transpiration (ETo) in our area. ETo is the amount of water lost through evaporation and transpiration (uptake by plants). This information is available through the California Irrigation Management Information System (CIMIS) website operated by the California Department of Water Resources. Through this website, I can track daily (or even hourly) ETo, as well as precipitation and soil temperature. Each Friday, I check these numbers and note them in my irrigation log - which allows me to make adjustments in my irrigation schedule. Between May 18 and May 24, the ETo for the Auburn CIMIS station was 1.16 inches - that means soil lost 1.16 inches of water to plants and evaporation in the last week. To keep our plants growing, we need to add at least that much water back into the soil. Mother Nature provided about 80 percent of our water demand this week! We've kept irrigating, which means we're banking soil moisture for the drier, hotter weather sure to come. 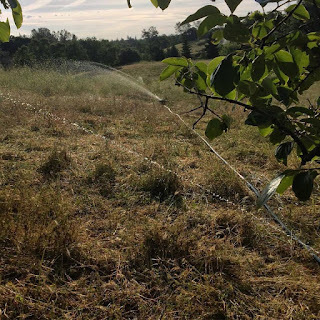 On the negative side, our rangeland (or unirrigated) pastures are dominated by annual grasses and broadleaf plants (which we call forbs - things like clover and filaree). Annual plants must complete their life cycles each year - that is, they germinate, grow, flower (reproduce) and die. Most of our forage plants germinate in the fall (with some notable exceptions that I'll explain below), grow through the winter and spring, and reproduce and die in the late spring or early summer. In managing our rangelands for grazing, we evaluate peak forage production some time in May, and then ration out this standing "crop" until the next growing season begins in the fall. Our sheep are ruminants, which essentially means that the microbes in their foreguts (their rumen systems) are able to break down the cellulose material in forage and extract essential nutrients. These "bugs" in the sheep's guts require a diet with about 8 percent protein to thrive. Green, growing forage can be anywhere from around 12 percent protein to as high as 25 percent. Dry, dead forage, on the other hand, can be as low as 3-4 percent protein. And when this dry forage gets rained on, many of the remaining nutrients (including protein) are leached out. So rain on our dry annual grasses actually decreases its value to our grazing sheep. 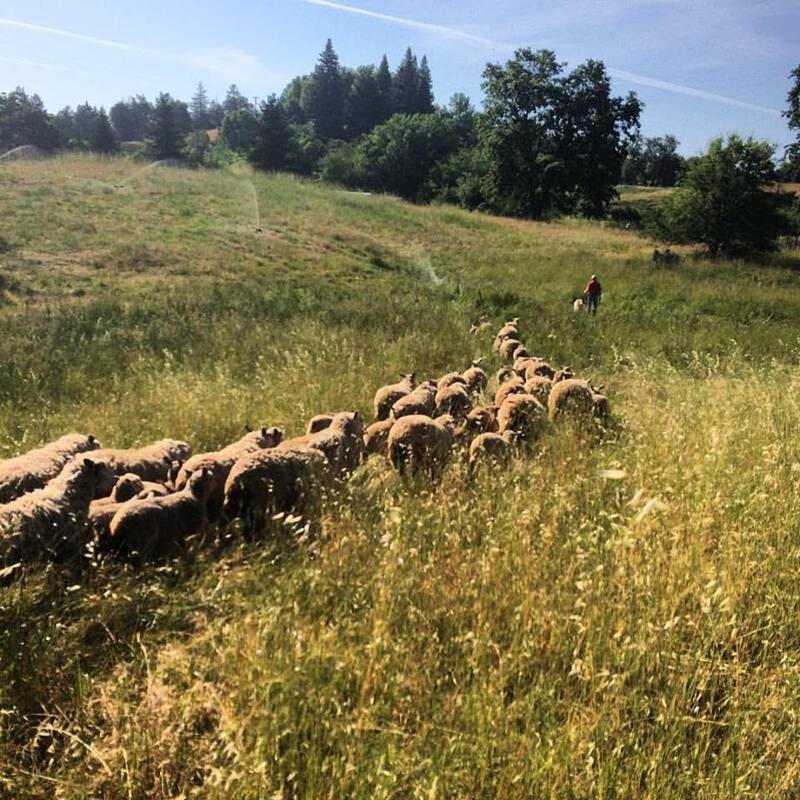 We can get the sheep to eat the dry grass, but we have to provide supplemental protein to ensure the health and vigor of their gut microbes. Some of my friends say that ranchers are never happy - it's always too hot or too cold, too wet or too dry. When the market for lambs is high, we don't have enough grass. When we have plenty of grass, the market crashes. I suppose there is some truth to what my friends say, but I also think that trying to earn an income in partnership with Nature is fraught with uncertainty. These late spring rains are a great example - they help with our irrigated pastures (a blessing), but they hurt the nutritional value of our annual grasslands (a curse). I guess we'll just keep taking whatever Mother Nature serves up!